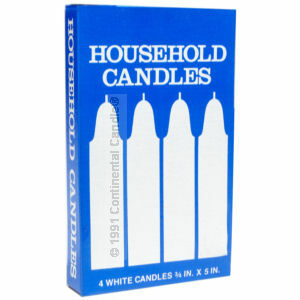 Our four pack Household Candle includes four white candles measuring approximately 3/4 inch x 5 inch each. Household candles have many uses such as for emergency lighting, patio lights, holidays and parties. Part of the Continental Candle® line of quality candles. Always follow safety precautions. Candles should be burned within sight, out of the reach of children and pets, and never on or near anything flammable.